Our aluminium gutters serve a lot of purposes due to the advantages it can offer for both domestic and commercial use. Its long durability, sleek presentation and ability to deal with high capacity of rain water, makes it a great choice for anyone looking for a new guttering system to be used on older buildings or modern structures which deal with harsh wet weather and have an aesthetically pleasing finish. Aluminium is a very reliable material which is why we use it. It’s capable of dealing with harsh physical damage that would damage weaker materials that could be used like PVC, whilst remaining light weight as to not add to much strain to a building’s exterior wall that heavy materials like a steel guttering system could cause. This sturdy material, when pressed into a box style, offers another advantage. Due to it being wider than most other gutter systems, it is more than capable of dealing with high, constant volumes of water from rain fall whilst remaining efficient from debris that could enter the system which would lead to blockages causing an overflow. We are also able to install the guttering system in 2 direct ways with could extend the guttering systems longevity and increase prevention from any debris. We can install the aluminium box guttering at the bottom of fascia boards which is not an option with other styles, suitable for extensions, or they may be installed underneath a roof overhang. Doing this will reduce any the amount of debris that can enter the system from strong winds, ensuring a gutter system that can and will work longer without intervention in a harsh, windy environment. They come in the ever popular Ogee profile. Aluminium box styled gutters (also known as square box or rectangle box) can fit most types of buildings of different architectural designs or age when used appropriately. With our wide variety of lengths, width’s and pieces, we are able to install our gutter systems in difficult or complex roofing systems that would cause an issue with other styles of guttering systems. The durability of aluminium as a guttering system material will mean any guttering systems we install will have a long shelf life, meaning that it is a wise long term investment for anyone looking for a guttering system with style that will not require constant repairs or replacements for domestic or commercial use. By being installed in a roofs overhand, the box style extruded gutter can be hidden from direct view if a clean design on the exterior is required with visibility of the gutter system only available underneath but not sacrificing efficiency. In addition, its clean, well fitted design from below will not cause any undesirable views which could ruin the overall finish of well-designed buildings. Length available from 0.5 – 3.0 metres and they can be produced in a range of RAL colours. Where are Box Gutters Used? Extensions or conservatories often use box styled guttering, but are usually fitted at the bottom of fascia board for a few reasons. By being fitted at the bottom of the fascia board, regular maintenance is much easier to perform whilst the simplistic design often compliment a newly built structure with modern architecture. This also offers high functionality that a box styled guttering system fitted within a roofs overhang should. Compared to alternative gutter materials that may be used with a box style finish like PVC on an extension or conservatory, our use of aluminium will mean that the guttering will be more capable of lasting longer in harsher environments which would wear away other guttering systems or cause visible discoloration that steel would show after long periods of time due to rust. 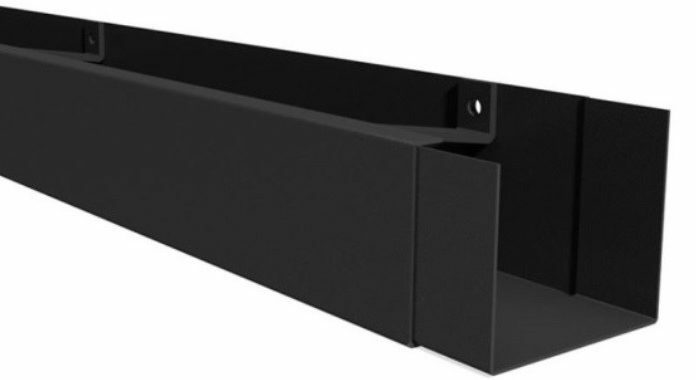 Using a powder coating, our aluminium box styled guttering systems are available in a wide range of colours. Meaning it is very easy to find appropriate colours to match or to give a contrast to a building’s exterior for a better completed design. Aluminium is a widely-used metal material. Because of its manufacturing process, it creates very little harmful environmental by-products. It is often recycled to be reused again meaning even less resources are used to make aluminium pieces. Our aluminium we use for our aluminium guttering, including our box styled guttering, are mostly recycled so that we can offer a more sustainable option for rain water gutter systems for all needs. All gutter systems require annual maintenance for continued efficiency and longevity of a gutter system. Due to the use of aluminium in our system, the guttering will not begin to rust that would require attention, unlike a steel installation which would demand a higher amount of maintenance. Nor will physical damage be an often occurrence because of its high durability to external attacks so replacements will rarely be needed. Although, internally, the gutter system must be checked annually for multiple reasons. The width of the box system will mean that debris can be easily introduced to the internals of the system when strong wind begins to cause debris. Regular checks will be required as the initial debris will not cause any blockages or lowered performance, after a prolonged amount of time, debris will begin to gather together due to water pushing the pieces of debris together as it would in other systems. Luckily, a box style design also means that clearing the internals of the gutter system will be very easy when dealing with larger pieces of debris like leaves or twigs or small stones. Tiny amounts of dirt will require a more direct cleaning process to remove to prevent a build-up that could cause issues to the guttering system later. Using a damp cloth or rag, cleaning the internal system is very easy because of all the flat surfaces meaning it is very easy to wipe without much hassle or being time consuming. Neglecting this will mean blockages can come from debris which will reduce water flow and at the extreme, slow water flow to the point the build-up will start over flowing from the sides. This may cause damage to exposed areas of a structure beneath or the ground below. Always examine the guttering system for any cracks or damage so that they may caught early on before they grow and cause leaking that would lead to damaged structures, particularly around the joints or union pieces of the system where sealant is used. The Aluminium Guttering Company supply and install seamless aluminium gutters. These are the highest quality grade gutter systems that are suited for any kind of property. Our rainwater gutter systems can be used for replacement, refurbishment, renovation and new construction. These can be produced in a variety of styles, including: extruded, cast iron, ogee, half round and modern. 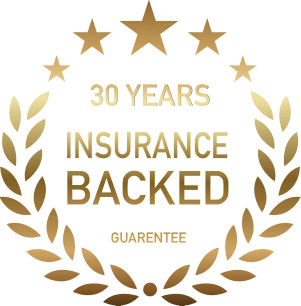 Our installers cover Greater London, Surrey, Kent, Essex, Buckinghamshire, Sussex, Berkshire and the surrounding areas of the UK.